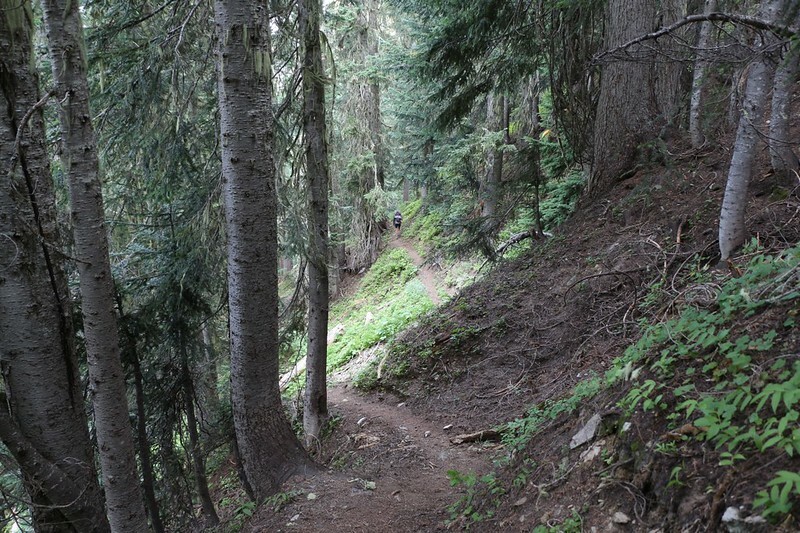 We hiked a relatively easy day, downhill from Buck Creek Pass, then up and over Middle Ridge. 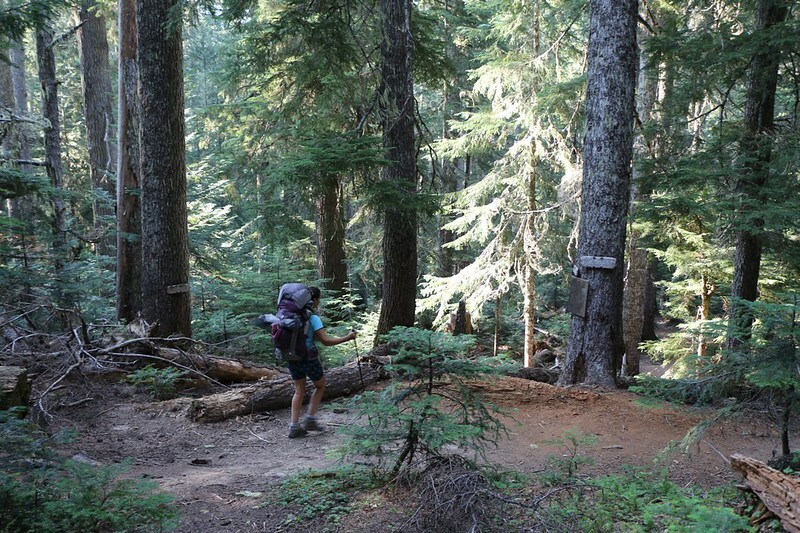 followed by a long easy downhill to the Pacific Crest Trail and the Miners Creek campsite. And that’s why we took our time waking up and getting our gear packed. The day’s hike wasn’t meant to be anything special. It was more of a transitional day, where we headed toward the next “Highlight” day of the trip. But that isn’t to say that it was bad. 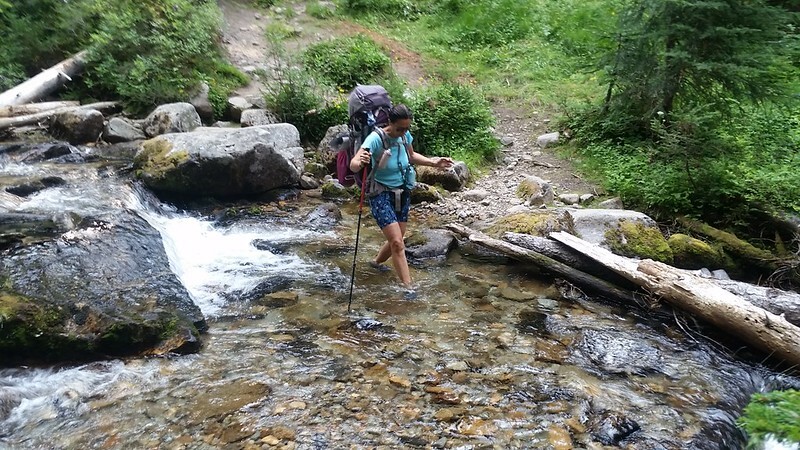 How could a day spent hiking in the wilderness, descending through thick forests, crossing babbling creeks, and checking out excellent views, ever be bad? It might be challenging, but never bad. OK, maybe I’m exaggerating. Anyway, after spending two nights in the same spot, our gear was more disorganized than usual, and it took us longer to get ready. Plus, it wasn’t easy to leave this excellent spot. Buck Creek Pass had been very good to us. But Image Lake was calling. It would take us two days to get to the lake. We knew that many people choose to hike it in one long day, but we had much more time on our hands, and we fully intended to enjoy every bit of it. So our plan for today was to hike within striking distance of the lake, which would leave us more time tomorrow to arrive in style, set up camp early, and explore the area thoroughly. We finally got moving around 9am, which is ridiculously late for us, but we weren’t too worried. We had about 7 miles to cover, most of which was downhill. This was our reward after spending two days climbing up to Buck Creek Pass. 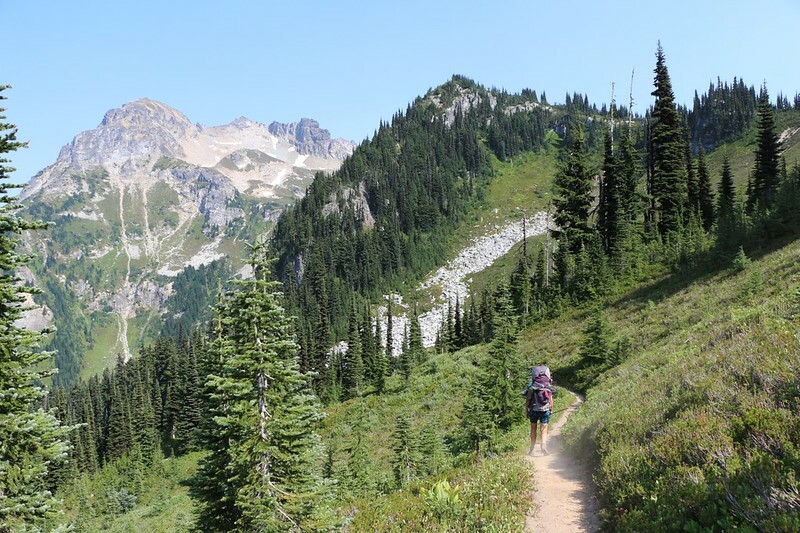 At first the trail stayed high, traversing flowery meadows, with great views toward Glacier Peak and Flower Dome. We had originally considered visiting Flower Dome as a day hike, but the High Pass Trail turned out so well that I’m glad we didn’t bother. Supposedly the Dome has great views, but it looked forested on top to me, so maybe the views were mostly of Glacier Peak and the Suiattle River Valley. We’ll never know. We passed on by and then the trail began to descend into the forest, dropping 800 feet until it crossed Small Creek at its lowest point. After that, the trail began the big climb of the day, ascending 1100 feet in two long, hot miles to the top of Middle Ridge. It was slow going, and as the temperature rose, out came the swarms of annoying Deer Flies. We knew that the lack of them yesterday was too good to be true. We sprayed ourselves with DEET and hiked onward. Just after noon, we arrived at the top of Middle Ridge. We were tired and hungry. We found a spot in the shade of a pine tree and set up the screened section of the tent. We brought our lunch and books inside with us and zippered up the door. This was our new method for enjoying the best parts of the wilderness without the bad ones. No bugs! It was warm and peaceful in there. We ate and took a nice long nap. And I mean long. We stayed in the tent for at least two hours. It was that nice. Eventually, however, even lazy people tire of being lazy. We decided to explore Middle Ridge, hiking on the old Goat Herder Trail. This was where we had originally intended to stay the night, primarily because of the great views. And they really were great. Taking a short day-hike up this trail wasn’t quite as good as spending the night up here, but it would have to do. 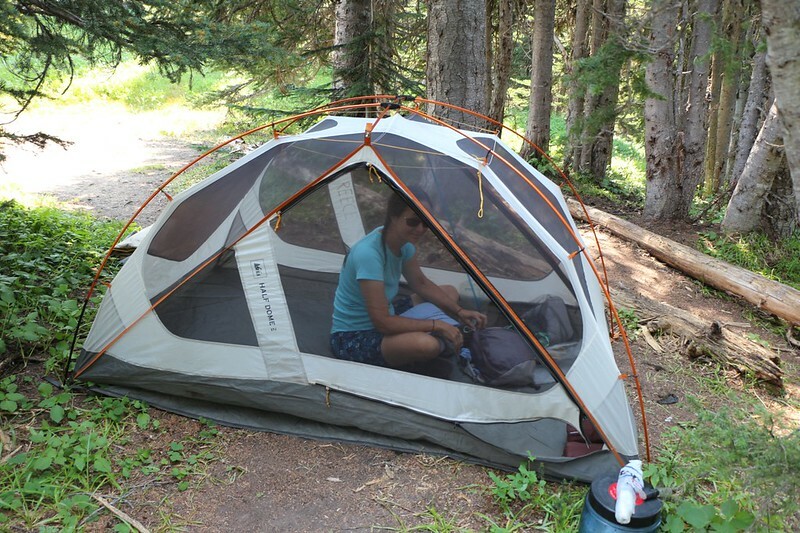 We enjoyed strolling along the ridgeline and through the high meadows, then returned to the tent. We packed up everything and said good-bye to Middle Ridge. We had four miles left to hike that day, all of it downhill. We were about to descend almost 1800 feet, so we tightened our shoelaces to protect our toes from damage and blisters. And down we went. Along the way we stopped to filter some additional water. We found some ripe blueberries and snacked on them. 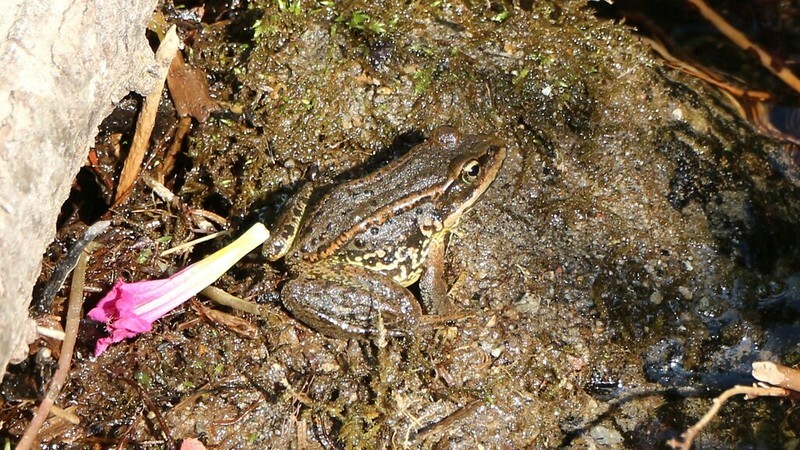 We saw some frogs in the little creek. And we headed down and down and down. Eventually the trail intersected the PCT. We were pretty excited, being PCT Section Hikers. It’s like meeting an old friend in an unlikely location. We’d only be hiking three and a half miles of it over the next two days but that didn’t matter. 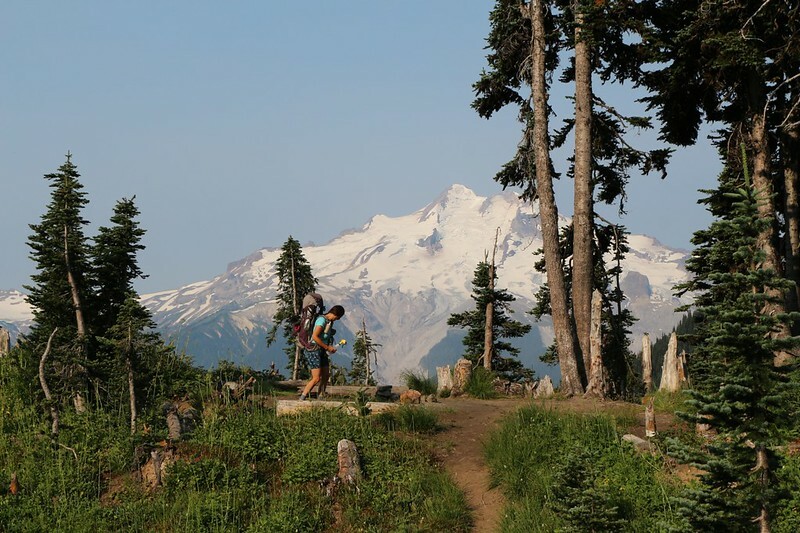 It was the PCT! We talked about when we might have a chance to hike this entire section, but realized that it might not happen for years. As in: after we retire. Oh boy. But that didn’t stop us from enjoying it now. 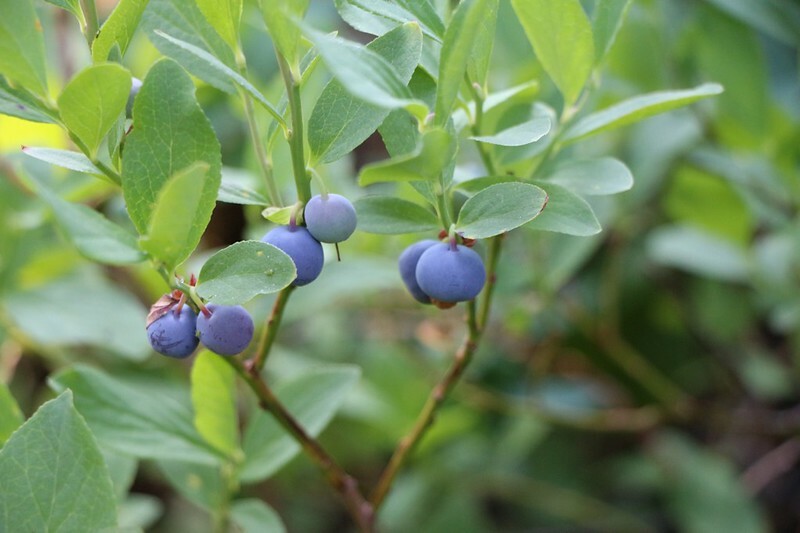 Ripe Blueberries lined the trail and we feasted on them as we hiked – Yum! 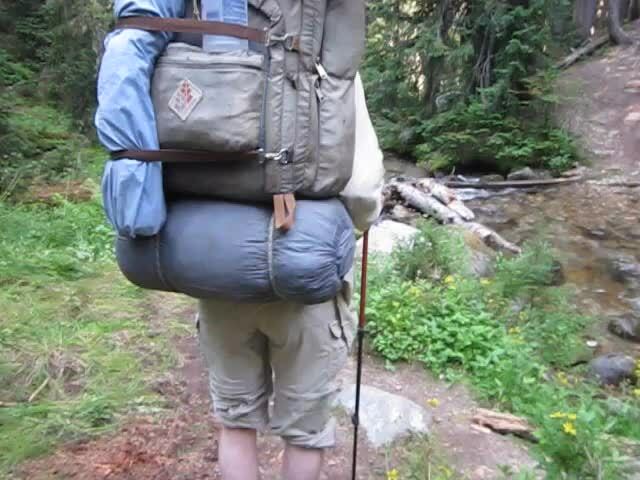 We hiked north on the PCT for about a half mile. It was late afternoon by this time, and we were happy to find a large campsite near the wooden footbridge over Miners Creek. 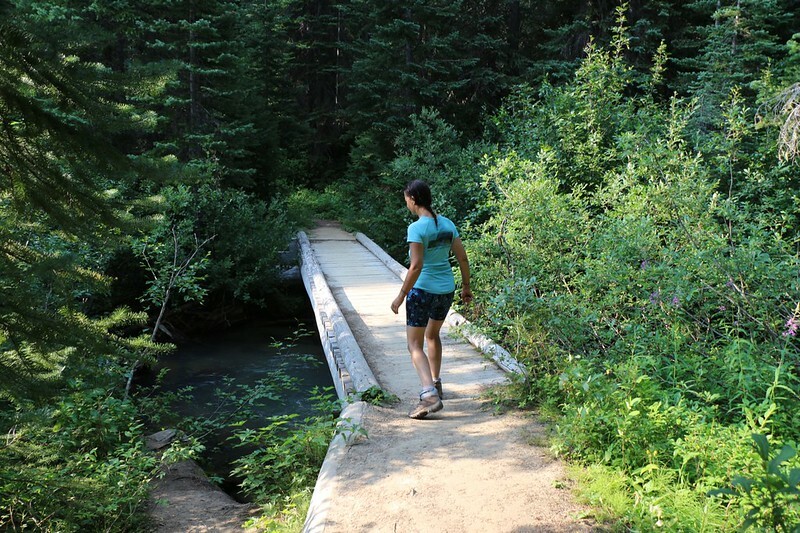 We set down our packs and wandered around, checking out the bridge and looking for a place to set up camp. There was nobody in the large campsite, but that didn’t mean anything. PCT Through-Hikers were known to hike all day long, timing it perfectly to arrive in camp at sunset, or even afterwards. We had no desire to have our rest disturbed by anyone. Plus, this campsite was under the trees, and afforded no view whatsoever. I was almost wishing that we had stayed up on Middle Ridge. So Vicki wandered down an old, disused side trail along the creek and found an open area with a view! She came back and told me about it. 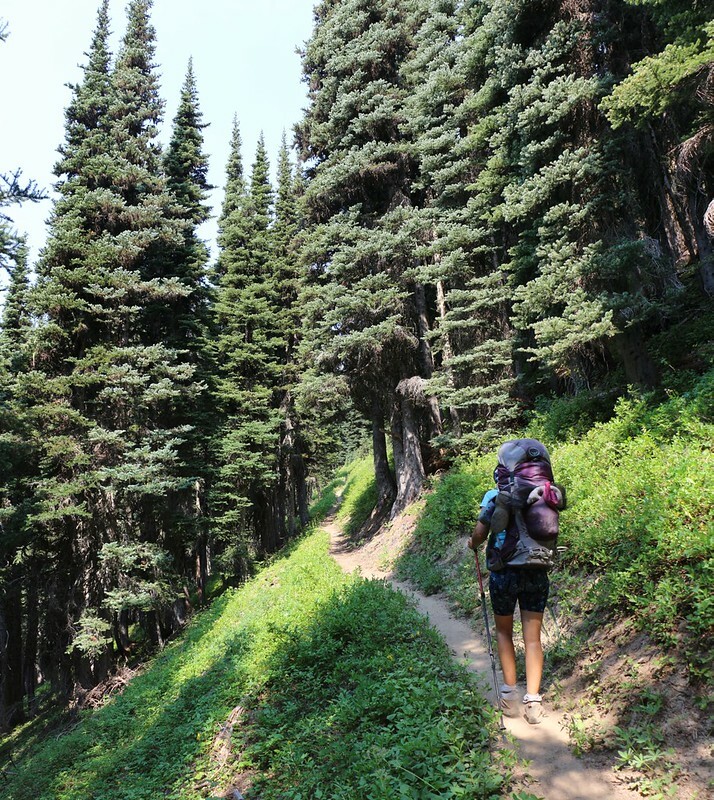 I was skeptical, but I shouldered my big pack and we headed up her “trail” which was mostly overgrown with berries and wildflowers. And, as always, Vicki’s crazy idea worked well, and there was an old campsite complete with fire ring, and it had a nice view of some nearby mountains. 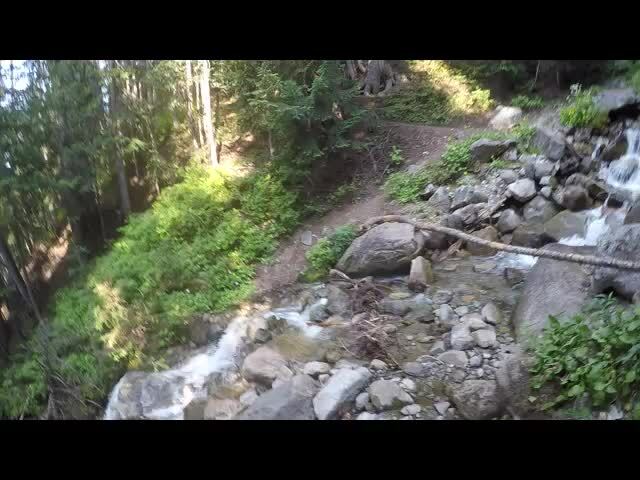 We set up camp, then hiked back to the bridge to filter plenty of water. There were still no PCT hikers in the big campsite but we didn’t really care. We were more interested in eating dinner and getting to bed afterward. Tomorrow morning we planned to wake up at 4:30am in the dark so that we could begin hiking at dawn. We had 1800 feet to climb in order to reach Image Lake, and Vicki wanted to tackle it while it was still cool outside. This would also give us time to check out the lake and visit the nearby Fire Lookout Tower on Miners Ridge. 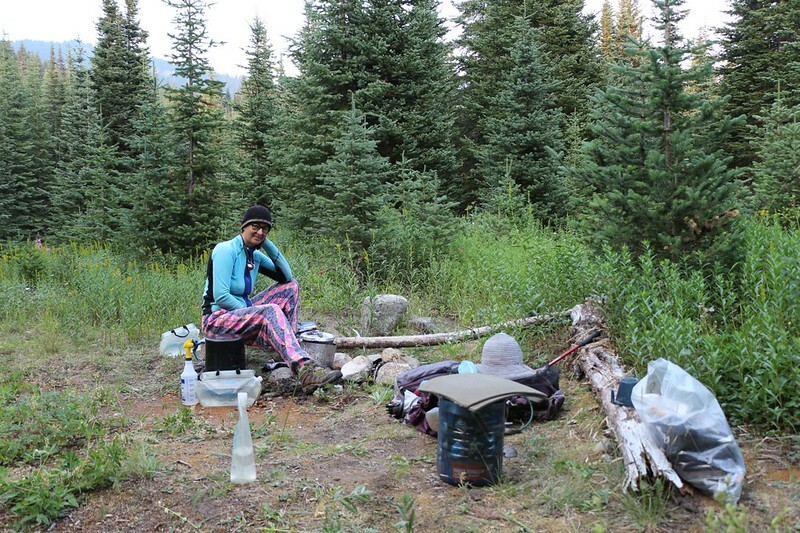 As we lay in our sleeping bag, we reviewed the day’s hike. It had been much better than expected, and the big nap and big views on Middle Ridge were some of the better parts. It may have only been a transition day, but it sure beat working in an office! We’d take that trade any time.